As part of a long-standing partnership, Credit Suisse supports renowned classical music institutions and their selected program highlights. Credit Suisse supports world-famous cultural institutions in the area of classical music, such as the the Beijing Music Festival, the Bolshoi Theatre or the Sydney Symphony Orchestra. At home in Switzerland, Credit Suisse is furthermore a long-term partner to major concert halls and festivals – from the Lucerne Festival to the Zurich Opera House and the Davos Festival. 2012-09-19 The Bolshoi Theatre is Moscow’s cultural landmark. Our film offers an insight into this "grand" theater. 2012-07-11 Each year the Sydney Symphony Fellowship Program takes a handful of Australia's most talented young musicians under its wing to help nurture the world's future classical musicians and conductors. 2012-10-01 The Sydney Symphony recently announced British-Australian Jessica Cottis as their new Assistant Conductor. "Jessica really impressed us", says Director of Artistic Planning, Peter Czornyj. Vilde Frang: "I want to do better after every concert"
2012-11-02 Anticipation about a past musical event: The prizewinner's concert by violinist Vilde Frang with the Vienna Philharmonic was a highlight of the Lucerne Festival. On December 13, it will be broadcast on the radio. 2012-06-01 In the spring of 2012, violinist Vilde Frang made her solo in Lucerne with Bartok. Later this year, she will play Sibelius with the Vienna Philharmonic under Bernard Haitink – as part of the Credit Suisse Young Artist Award. 2011-07-13 In collaboration with Credit Suisse, the Sydney Symphony Fellowship program shows its commitment to nurturing talent and excellence and the inspiration of a new generation of classical music enthusiasts. 2009-09-09 The Young Singers Project offers an impressive training program for opera stars of the future as part of the Salzburg Festival. This year eight young singers took part. 2008-09-10 Since 1999, Michael Haefliger has been Executive and Artistic Director of the Lucerne Festival, one of the oldest classical music festivals in Europe. In this interview, he speaks about his experiences and his views on leadership. The Bolshoi Theatre was founded in Moscow at the behest of Catherine the Great in 1776. Literally translated, Bolshoi Theatre means "big theater." The main building is a spectacular work of architecture and was reopened in October 2011 after a careful and extensive six-year renovation. This multifunctional house is one of the world's leading venues for musical theater and ballet. As General Sponsor since 2007, Credit Suisse enjoys the highest sponsorship status ever granted by the Bolshoi Theatre. In addition to the building in Moscow, the commitment also covers the Bolshoi's worldwide touring activities. Established in 1932, the Sydney Symphony Orchestra is the resident orchestra at the iconic Sydney Opera House. It performs over 200 times each year and reaches an audience of more than 350,000. In the 1930s, the orchestra became famous under the direction of Antal Dorati and Sir Thomas Beecham. Soloists appearing with the orchestra included Artur Rubinstein, Bronislaw Huberman, and Anne-Sophie Mutter. The Sydney Symphony is Australia's flagship orchestra, and its principal conductor is David Robertson. In its role as Premier Partner, Credit Suisse supports the Fellowship Program and the Assistant Conductor Position of the orchestra, as well as the Sydney Symphony Gala Concerts. 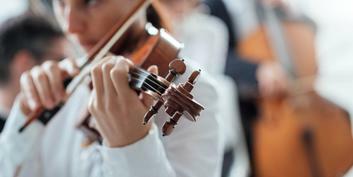 Since 2017, Credit Suisse is also the sponsor of the Credit Suisse Sydney Symphony Orchestra Music Education Program, an initiative to bring a structured music education program to six primary schools in Sydney and Melbourne. The program aims to improve the overall learning opportunities for young students and create a long-lasting culture of music in their communities. Since its founding in 1998, the Beijing Music Festival has developed into one of the premier cultural events in Asia; it is held annually and usually spans about 30 days in October and November. It is primarily dedicated to classical music and attracts artists and audiences from all four corners of the globe. Credit Suisse is a founding sponsor of the Beijing Music Festival and has supported it since 1999. In addition, the bank is Title Sponsor of the Credit Suisse Night, promotes the Classics for Kids concert series, and organizes the Credit Suisse Forum. The Lucerne Festival traces its origins back to 1938 when Arturo Toscanini conducted a memorable gala concert in front of Richard Wagner's onetime residence at the Tribschen estate. The following decades saw the rise of one of the world's leading music festivals, and Lucerne has played host to major orchestras, conductors and soloists from around the globe. Credit Suisse has been the festival’s main sponsor since 1993, and part of its commitment is to support concerts given by the Vienna Philharmonic. In addition, the Jubilee Fund of the Credit Suisse Foundation confers the Credit Suisse Young Artist Award and the Prix Credit Suisse Jeunes Solistes in alternating years with the aim of promoting young artists in Switzerland and from countries around the world. The "Credit Suisse Young Artist Award" and the "Prix Credit Suisse Jeunes Solistes" are awarded to outstanding young soloists in recognition of their exceptional achievements. The prizes are conferred by the Credit Suisse Foundation Jubilee Fund and the Lucerne Festival, together with the Vienna Philharmonic and the Gesellschaft der Musikfreunde (Society of Music Friends) in Vienna, and the Konferenz Musikhochschulen Schweiz respectively and it turns. Since 2004 the Jubilee Fund has also supported the unique Swiss Young Musicians' Competition, which forms the base of the musical sponsorship pyramid. In 2015, Serb Vojin Kocić became the first guitarist to win the Prix Credit Suisse Jeunes Solistes. In an interview with Credit Suisse, he talks to us about his musical ambitions, and what the guitar means to him. Zurich Opera House is regarded as one of the world's most successful music theaters. Each year, it plays host to around 300 operatic and ballet performances, concerts and song recitals with top-class performers. Credit Suisse has been a partner of the Zurich Opera House since 1989 and supports two new productions each season. Credit Suisse also supports communication and education projects such as "Club Jung," which is aimed at audiences between the ages of 16 and 26. In 1999, the Tonhalle Orchestra Zurich achieved international renown when it won the German Record Critics' Award for its recording of the complete Beethoven symphonies. Founded in 1868, the orchestra performs some 50 programs in approximately 100 concerts a year at the Tonhalle Zurich, a concert hall that is considered an acoustic masterpiece. The Tonhalle Orchestra Zurich also makes guest appearances in Switzerland, performs concert tours abroad, and records numerous CDs. Credit Suisse has been partner of the orchestra since 1986 and sponsors the "tonhalleLATE" concert series intended for younger audiences, along with TOZZukunft, a fan community for young people. Born out of a simple father-son conversation, "tonhalleLATE" has become the most popular Tonhalle Orchestra Zurich concept within a little more than ten years. The Orchestre de la Suisse Romande enjoys an excellent international reputation. Founded in 1918, the orchestra boasts a long history marked with numerous premieres of works by composers such as Benjamin Britten, Claude Debussy, Arthur Honegger, and Igor Stravinsky. The orchestra performs mostly in Geneva and Lausanne. Credit Suisse has been the main sponsor of the Orchestre de la Suisse Romande since 1991. The Davos Festival was founded in 1986 as a platform for highly talented young musicians from around the world, and its "young artists in concert" concept has since made Davos a mecca for young musicians for three weeks every year. From its start, Credit Suisse has been the main sponsor of the festival.